Since its onset in 2000, YIP has become one of the premier training and education programs offered at the national level. 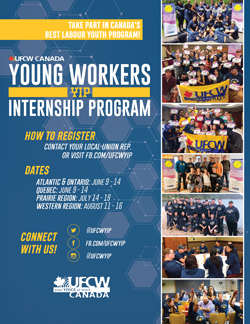 The program caters to young members who want to become more involved within their union and are interested in Labour History, Organizing, Globalization, and more. YIP provides a way to connect with young members on topics that are relevant to them and the labour movement as a whole. Course discussions throughout the program help foster a better understanding of unions, the economy, globalization, organizing and human rights. YIP also focuses on how young members can make a difference in their Local Union and beyond. This year's YIP will focus on hot topics such as Making a Difference, Your Union, Media Literacy, and Political Economy and Democracy. Applicants may only apply in their region where their workplace is located. Click on your region below to download an application and find out more. All YIP applications must be submitted to your local union by fax or email. For Local Union contact information please click here.